In a New York City slum, the NYPD raid a rattrap apartment building. Inside one of the rooms they find several Utrom junkies getting “high” with consciousness-expanding menta-wave helmets. The helmets create lucid illusions within the mind of the user and those who utilize the helmets can become so engrossed in their fantasy that they let their bodies expire. As a result, the Utrom government has made use of the menta-wave helmets without authorized supervision illegal. As the cops clean up, one of the detectives notices a lot of famous Utroms amongst the junkies. The other detective explains that intellectuals are some of the most common victims of the helmets, as they’re lured in by the possibility of enhancing their cognitive faculties. One of the Utroms manages to slip their helmet off and make a break for it out the bathroom window. Apparently, this Utrom was one of the greatest explorers and scientists of his kind, having done a great number of unbelievable things with his life. Unfortunately, his life ends here. The Utrom slips while climbing out the window and falls several stories, crashing into a fruit stand. The last thing the Utrom sees before he dies is a single grape. *This story is continued in “The Raisin'”. *The events of the Professor Obligado serial take place at some point after TMNT (Vol. 4) #5, when the Utroms initiated First Contact and aliens began living openly on Earth. *The menta-wave helmet was first introduced in Fugitoid (microseries) #1, having been invented by Professor Honeycutt (alias the Fugitoid). The Fugitoid rediscovered the menta-wave helmet in Tales of the TMNT (Vol. 2) #54 while living alongside the Utroms, which may be how they got their tentacles on the technology. *Further misuse of the menta-wave technology by shady Utroms will be seen in Tales of the TMNT (Vol. 2) #31. The Professor Obligado serial was one of the more fun bonuses Mirage included during the early years of Tales of the TMNT Volume 2. The stories got weird and goofy, but you sort of grew attached to this little Utrom egghead, who’d wind up doing a lot of crazy and adventurous stuff contrary to his less-than-impressive appearance. Opening the serial with his death was a bold choice on Murphy’s part. The narration accompanying the story is actually just an exhaustive list of all the bizarre and amazing feats Obligado (not named in this first chapter) accomplished over the course of his incredible life. And despite doing all those great things, his life ended in the most pathetic way possible: As a junkie running from the cops. Bleak commentary, but Murphy doesn’t overdo it. In fact, with the bold “THE END” concluding the short, I got the impression Murphy didn’t initially intend for this to be a serial at all. Whether by accident or design, this format worked well for the storyline. So much of this opening chapter is spent describing the things Obligado did and in a couple chapters we're going to start seeing some of those adventures. He's like a pink, squishy Citizen Kane or something. 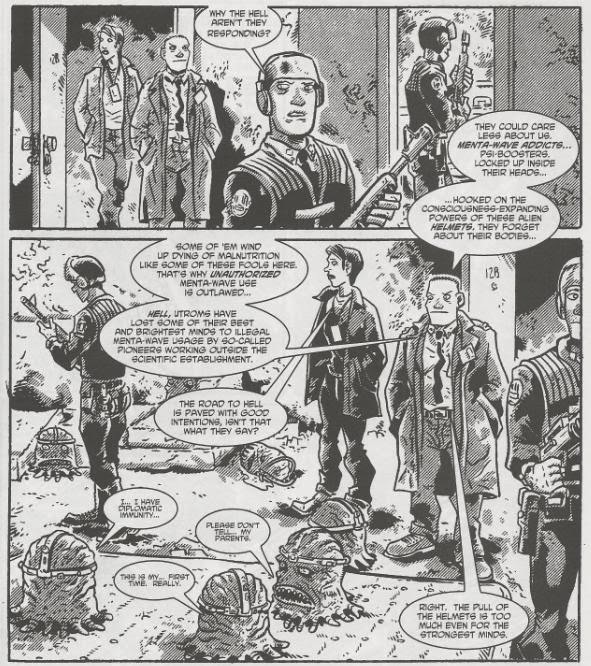 Unfortunately, the Professor Obligado serial wound up being one more of the many storylines initiated during Tales Vol. 2 and never concluded; it’ll be left lingering on a cliffhanger. It's a bummer, but well… We kind of already know how his story ends, don’t we? We may never get to see exactly how Obligado ended up in a sci-fi crackhouse, but there’s no mystery as to his ultimate fate. 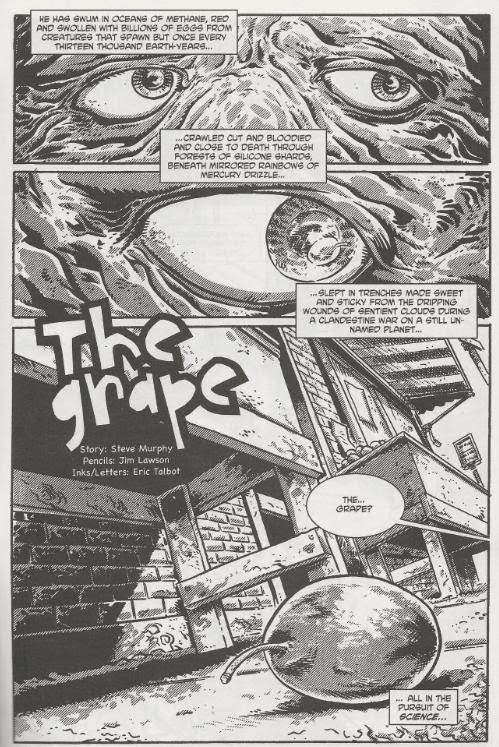 The Grape and The Raisin' (the later Obligado strips intrigued me less, though they're still fun) are exactly the kinds of things I love about the Mirage TMNT, the post-2002 stuff in particular. It's just so ... strange and bleak, the first time you encounter it. In the first two Red Dwarf novels, the Better Than Life game was pretty much the same as the metawave helmets in this story.